Josh Henderson, owner of Skillet Street Food and Skillet Diner, will be opening not one, but two new eateries! One will be called Westward, which will feature a seafood menu prepared by chef Zoi Antonitsas, formerly of Madison Park Conservatory. 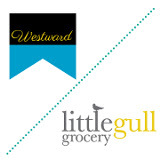 The second will be called Little Gull Grocery. The grocery will also sell beer and wine, as well as, have a small oyster bar. The new restaurant and grocery will be located in a former catering building on north Lake Union. This location currently has a large dock that Henderson hopes will be used by boat traffic to visit his new projects. Henderson also mentions a large outdoor patio to take advantage of the beautiful Seattle skyline across Lake Union. The openings are set for sometime early Summer. I'm really excited for this project! Josh has done an excellent job with both Skillet Street Food, and with Skillet Diner. I hope this project is just as successful! I'll be looking forward to having some good food and a cold beer on a warm summer day out on the patio.